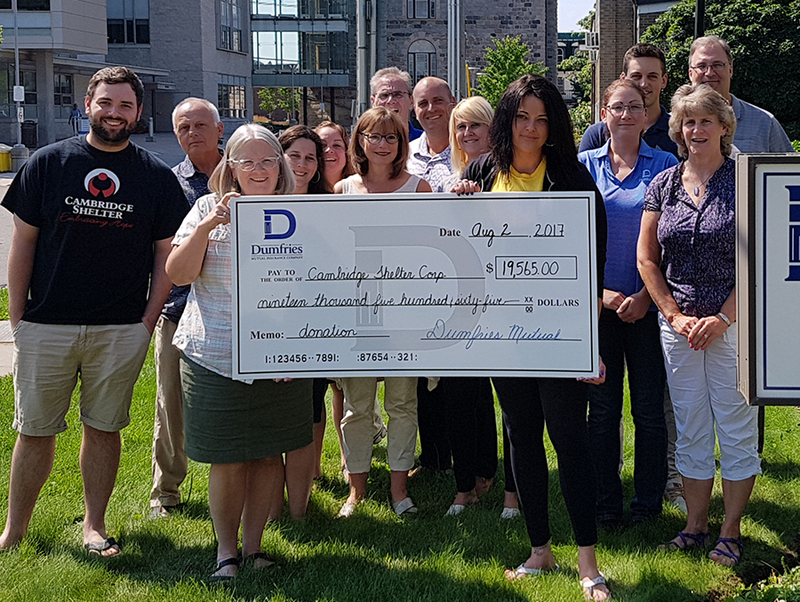 Dumfries Mutual Insurance Company held its 5th Annual Charity Golf Tournament on June 15, 2017, raising $19,565 for the Cambridge Shelter Corporation. The annual tournament serves two main purposes of raising money for a deserving local charity and thanking partnering organizations Dumfries Mutual works with. 139 golfers participated in a great day of golf at the Savannah Golf Links, under favourable weather conditions. Donations were raised through hole sponsorships, a sponsored BBQ lunch, player cards (for mulligans, a “beat the pro” contest, and a putting competition), and live and silent auctions. A delicious steak dinner prepared by the golf course was enjoyed by all. On an annual basis, Dumfries Mutual selects a local charity who they feel is doing good work in the community and would make effective use of financial support. Cambridge Shelter Corporation is a United Way partner agency who provides safe shelter as well as programs and services for people dealing with challenging life situations. This non-profit organization was developed from the Out of the Cold program in Cambridge which operated out of seven local churches during the winters of 1998 to 2005. Charities supported by the golf tournament in the past include Women’s Crisis Services of Waterloo Region (donation went to Haven House in Cambridge), Civil K9 Youth Services, Cambridge Memorial Hospital, and Big Brothers Big Sisters of Cambridge. Dumfries Mutual would like to thank all the sponsors and supporters of this year’s deserving cause. The staff, agents, and board of directors are already looking forward to the 2018 tournament!